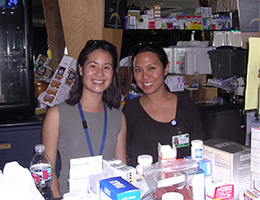 Monday, Oct. 22, 2007 marked the beginning of a four-day medical effort at Qualcomm Stadium to save lives, redefine teamwork, and discover heroes. Firestorm 2007 required the mobilization of volunteers to provide food, shelter and medical care to thousands of evacuees from threatened areas inside and surrounding San Diego County. 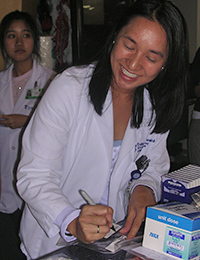 Requests for qualified volunteers were broadcast via news, radio, internet, phone and word of mouth, and it was because of the overwhelming response from proactive, competent and efficient healthcare professionals that medical operations at Qualcomm were established and run efficiently during this time of crisis. I responded to the Qualcomm effort after receiving an e-mail soliciting pharmacy services from the San Diego Pharmacy Emergency Response Team (RxERT). I contacted Dr. James Dunford, M.D., who was coordinating triage operations at the stadium, stated my qualifications as a fourth-year student pharmacist at UCSD and was told to report to Gate A as soon as possible being they had no pharmacy presence and were in need of assistance. The first day at the stadium was frenzied as professionals representing pharmacy, nursing, family medicine, pediatrics, psychiatry, respiratory therapy, ophthalmology and emergency medicine gathered together to establish a workflow; identify and prioritize immediate patient needs; and formulate a plan for the critical days to follow. The Qualcomm command center was established in one of the box offices on the Plaza level, simulated skilled nursing facilities were established on the Club level, and pharmacy set up behind the bar in Room 5, which became the critical care and triage center at the stadium for those patients with urgent medical needs. At 1 a.m. on Tuesday morning, a team meeting was held in the command center to review what had been accomplished during Day 1, assess the needs for Day 2, and allocate responsibilities to accomplish the grand task of running a satellite hospital and long-term care facility from a football stadium. 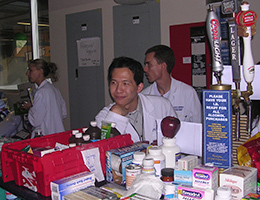 In the hours following the leaders’ meeting, I worked with Dr. S. John Johnson, Pharm.D., the Qualcomm pharmacist-in-charge from Sharp Memorial Hospital to outline our plan as the stadium pharmacy, and then proceeded to get thirty minutes of sleep on a cot behind the bar (i.e. pharmacy counter) with our limited narcotic supply “secured” at the bottom of my sleeping bag. Tuesday, Day 2 presented with new challenges as the Santa Ana winds flared, the fires spread and the number of evacuees increased. The day dawned with a mass influx of patients from skilled nursing facilities around the county, most lacking medication histories, medical charts or medications. While some patients had sound knowledge of their medical conditions and therapy requisites, many more were unable to either comprehend or communicate their needs. In response to this critical information deficit, it was necessary to recruit qualified volunteers to approach each patient independently and elicit a medical history and medication reconciliation from the patient and their caregiver, where appropriate. By the end of Day 2, all 500+ patients had been consulted and medical charts made, information was being electronically compiled, medications were distributed, and it was evident that the medical relief effort was becoming a well-oiled machine. With the establishment of quality patient care, energy and resources were then allocated to those 7500+ civilian evacuees in need of over-the-counter (OTC) therapies to treat headaches, constipation, diarrhea, etc. These drugs were available in the triage pharmacy in abundance, but a better system was needed to provide these resources to those outside the critical care areas. In response to this need, a satellite “drug store” was set up on the ground level at Gate A and OTC drugs and basic needs items (i.e. hand gel, Band-Aids, etc) were provided to those who requested them, and the med-station was advertised on the radio and stadium intercom. Day 3 began with the recall of several mandatory evacuation notices for areas in San Diego County and the implementation of new evacuation orders. Day 3 operations therefore included the maintenance of patient care, and continued replenishment of medical and drug supplies, while also identifying those patients who could return home, and of those, which individuals had a home to return to. This became a priority over both Day 3 and Day 4 as we began deconstructing hospital operations at Qualcomm. The need for psychiatric support increased as patients and civilian evacuees learned of the loss of their homes, pets, livestock, and businesses and treatment of the subjective became an equal priority to that of the objective in triage. By the end of Day 3, most long-term care patients had either returned to their skilled nursing facilities or homes, or had been transported to other relief sites including the Del Mar Fairgrounds, which was our primary diversion site. Official deconstruction of medical operations at the stadium began the morning of Day 4. All remaining patients were relocated and this was accomplished in cooperation with FEMA (Federal Emergency Management Agency), the state cache of supplies were packed up and transported with the help of the National Guard and Police Department to Del Mar, all other medical supplies were returned to those who had donated them and the excess donated to the American Red Cross, and the residual pharmaceuticals were donated to the San Diego Free Clinics and to other satellite care areas in need like The Rock Church in Point Loma and Poway Community Center. Medical operations at Qualcomm were affectionately referred to by healthcare volunteers as “The Real World, Qualcomm,” because it was a real-world example that defined “what happens when people stop being polite...and start getting real,” as the MTV show’s catchphrase states. It is because of remarkable leadership, a commendable cooperative spirit, and incredible anticipation of needs that the Qualcomm medical disaster relief effort was truly a success and one that should be noted. While there is always room for improvement and further debriefings will occur to document what was done and what could have been done better, I can say that I am proud to have been a part of this process and can state without a doubt that we provided quality care to each and every person placed in our care. Thank you to those of you who offered your time and services. We all have something to be proud of, and I feel privileged to be part of such a generous and proficient community of healthcare professionals. To a job well done.